Last night we sat down to my daughter’s cooked-all-by-herself macaroni and cheese and a giant plateful of sliced tomatoes, all different shapes and colours. 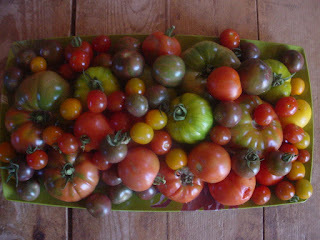 There were tiny and sweet orange tomatoes, large brown and small red cherry tomatoes, bright yellow plum tomatoes, huge red beefsteak tomatoes, green-but-ripe tomatoes and a beautiful kind that is red with green stripes. There is even a kind with fuzzy yellow-orange-pink skin!!! All this is thanks to Josie of Seachange Naturals in Centreville, who grew tomato and other organic vegetable transplants to order this year. In March, I looked through a fantastical list of varieties she was planning to grow and picked 2 dozen to try. They arrived at the Cafe at the end of May looking healthy and lush, ready to bolt out of their already roomy pots. Josie uses only organic fertilizers and much larger containers than most nurseries, which means the plants were already well on their way by the time I planted them in my new and slightly less than ideal garden bed. 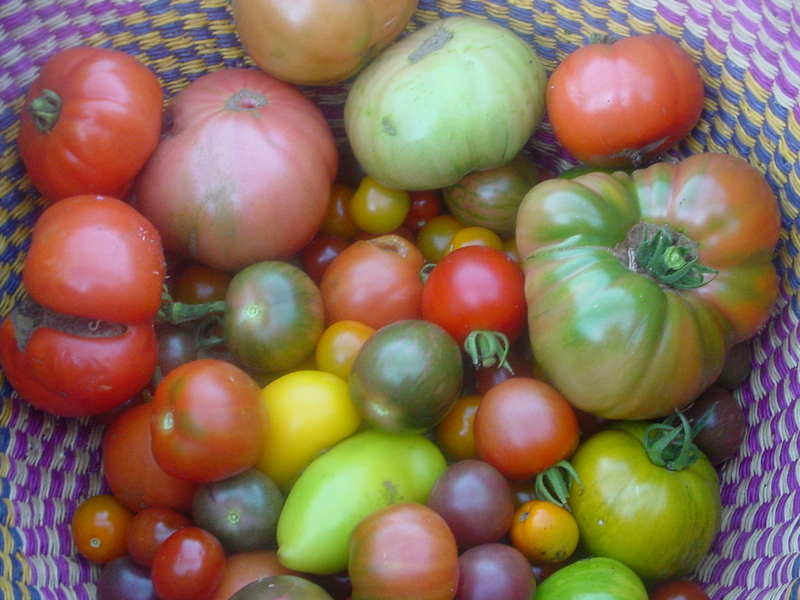 There they have grown beautifully, and are ripening by the basketful. As long as I can keep the chickens out, we’ll have more than enough for us and the Cafe. We gratefully buy tomatoes from Den Haan’s hothouse for most of the year. With a little time in the warm kitchen, they are very good. We have also obtained incredibly early organic tomatoes from the Penners of Goldfinch Farm, who also grow theirs in a wood-heated greenhouse, but on a much smaller scale. Henry and Dora, along with their son Nelson, grow a huge variety of spectacular produce on the outskirts of Berwick (just look for the sign on Willow Avenue or find them at the Wolfville Farmer’s Market). As a kid, I remember briefly preferring the plastic wrapped rectangular cage of hard winter tomatoes to the drippingly sweet and soft tomatoes of summer. I’m not sure what I was going through, but I’m over it now. This sandwich, my favourite of all time, sure helped. 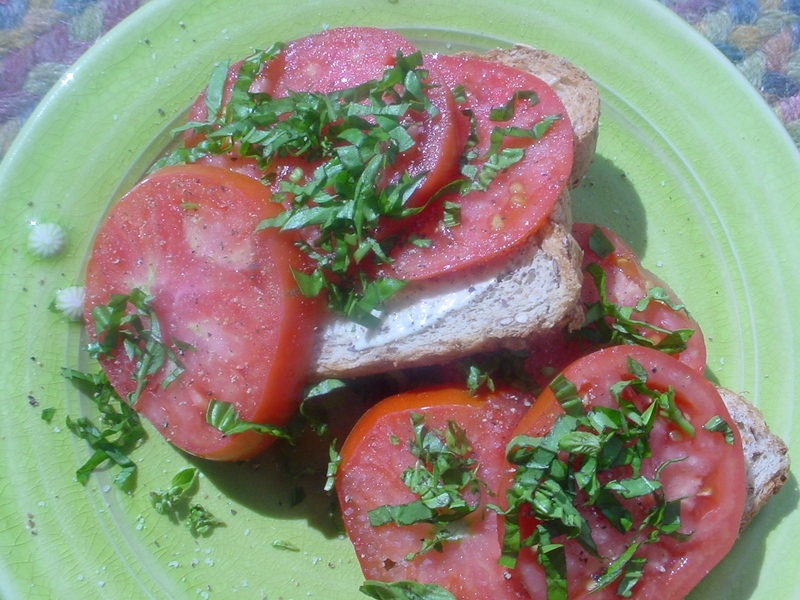 Don’t make this unless it’s tomato time! Toast the bread and rub one side of each with the garlic. Spread a little (or a lot) of mayonnaise on both. 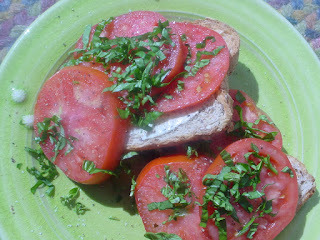 Stack one with as many tomatoes as will fit, sprinkle with salt and pepper and lay on the basil. Top with the other slice of bread, cut in half, and enjoy the rapture. Excellent just off the grill, but equally welcome warmed up the next day. May I suggest as a topper for otherwise vegetable-less mac and cheese? Cut the zucchini thickly on the diagonal. Cut each onion into four wedges. 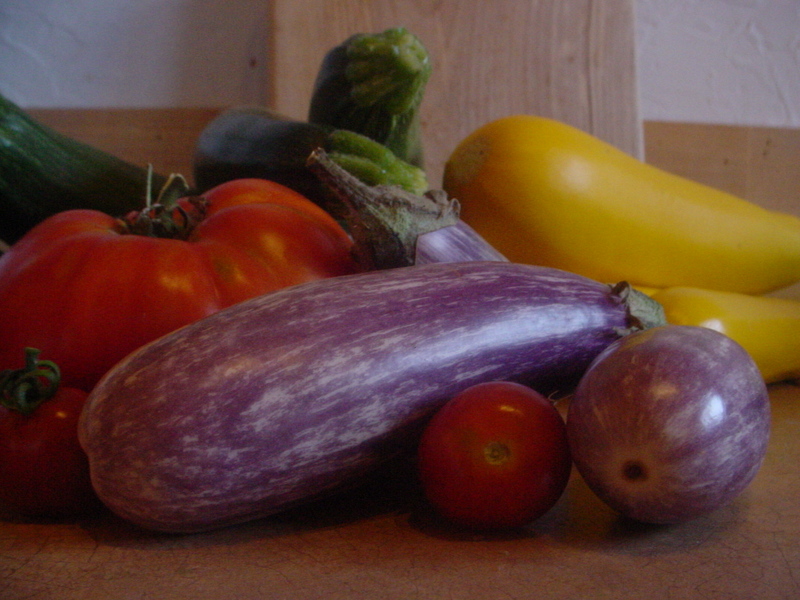 Slice the eggplants thickly and put all the vegetables in a large bowl. Drizzle with the olive oil and sprinkle with a healthy teaspoonful of salt and some pepper to taste. Fire up the barbecue. When it’s nice and hot, turn it to medium heat and place each vegetable one by one on the grill. Cover for a few minutes and cook, then turn each piece over with tongs. Meanwhile, chop the tomatoes roughly and place them in the same bowl the vegetables were just in, along with the garlic and balsamic vinegar. When the grilling vegetables have cooked to your liking (make sure the eggplant is completely soft), throw them all in to the bowl. Toss gently. You may want to cut the veggies into smaller pieces before serving, or just cut them up as you eat. I love your pretty tomato pictures. I see how much you love fresh from the warm earth vegetables, ripe and succulent fruits, local wines, delicious cheeses -We are proud of our Valley and the bounty it provides. Help us kick off this annual celebration-Valley pumpkin Fest-Septmeber 30th,11am At Churchill House in Hantsport -hope to see you there!